Free-range Spanish pigs, living on natural forage including acorns, produce pork that is celebrated by gourmets around the world. 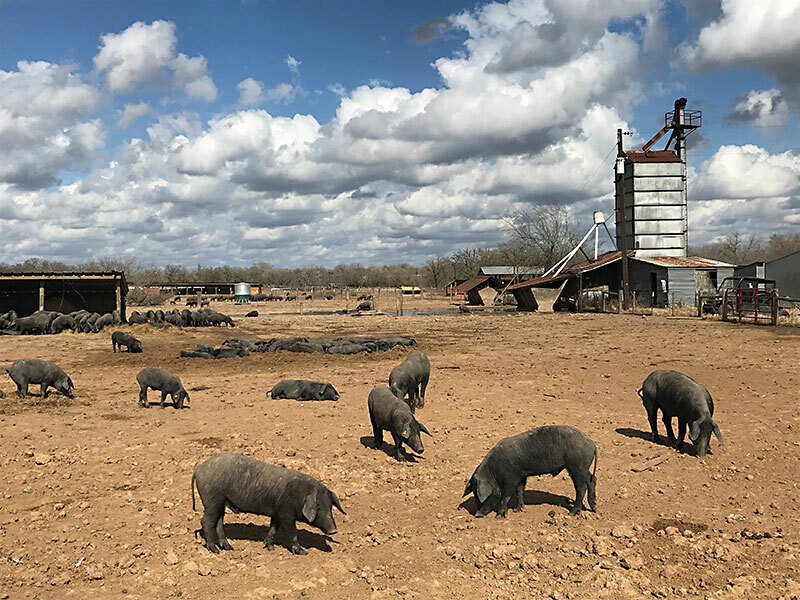 In Texas, anti-competitive regulations and bureaucratic red tape effectively prevent Texans from marketing free-range “feral” pigs, many of which occupy ranges that are similar to those of Spain. NOTE: this article was originally published to AustinChronicle.com on November 13, 2018. It was written by Adrienne Whitehorse. It’s not technically considered an aphrodisiac, but the physiological response to a paper-thin slice of Spanish ham slowly dissolving on the tongue is undeniable. Jamón Ibérico de bellota – the cured hind leg of a black Iberian pig, indigenous to southern Spain and Portugal, and fattened by acorns – is protected by a strict denominación de origen, which certifies genetic breed, geographical region, and production quality. The delicacy – salted and cured for two to four years – wasn’t even available in the U.S. until 2007 when the Spanish government relaxed export restrictions. These days, imported whole legs are displayed like trophies and shaved to order at several Austin tapas restaurants like Barlata, Bullfight, and El Chipirón. But sometime in 2019, an equally superior product will be available from Texas-born and -bred “Ibericus” stock, thanks to the state’s abundant live oak population – and two Spaniards with big ambition. Acornseekers materialized when Manuel Murga, an agricultural engineer and farmer whose family has raised the pata negra (“black hoof”) for generations, met Sergio Marsal, a marketing-savvy businessman. “He’s also a professional in eating jamón,” jokes Murga at their 300-acre farm in Flatonia, Texas. Six years ago, a mutual friend introduced the pair when learning of their identical urge to expand the market of the prized pork. By then, Murga had already traveled around South Texas, collecting samples of acorns to take back to Spain to be analyzed by a lab. What makes this meat so special is for the last five months of their lives, the free-roaming beasts enjoy a diet exclusively of acorns, which imparts the trademark nutty flavor and velvety texture. “Compared with the Spanish acorns, the quality and composition was exactly the same,” says an enthusiastic Murga of his live oak specimens. He knew his Spanish pigs would thrive in the Texas Hill Country, but a few more years would pass before the partners could comply with the USDA’s still-developing rules on swine immigration. Finally, in the summer of 2014, 150 patas negras boarded a KLM flight from Amsterdam after traveling by truck from Murga’s family farm near Sevilla. After a monthlong quarantine in New York, the pioneers began a 38-hour drive to Texas. Piglets are raised at the Flatonia facility, an hour southwest of Austin, because of its centrality to large concentrations of live oaks throughout the state. When ready for the fattening season (called la montanera), the adolescent swine are sent to four other regional branch farms. In these vast acreages, each porker can put away over 15 pounds of acorns a day. “They are like vacuum cleaners,” laughs Murga.